Manufactured and assembled in New Zealand. All models come with a 30 year warranty. Built with strong aluminium extrusions that will not rot rust or contaminate soil. Engineered to AS/NZS 1170 standard. Proven and tested by NZ consulting engineers. Features A grade toughened safety glass to standard AS/NZS 2208:1996. Full length aluminum gutters which allow catchment of pure rain water and has no draughty air gap at eaves. Features a high pitched roof angle for maximum light transmittance. Has condensation channels for protecting plants from droplets. 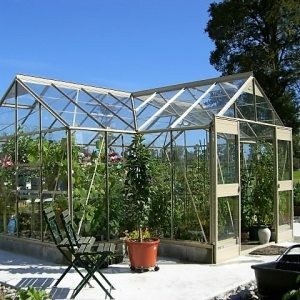 Features tension sealed glazing to collect solar heat energy for plant growth. Fingertip sliding wind proof doors hung on silent nylon wheels in a weatherproof track. Has an advance ventilation system with auto openers on ceiling vents and manual wall louvres. Each model comes standard with louvres and vents to suit cooler climates, glasshouses in warmer areas will need extra louvres and vents.